Dirt: Regular baths will remove dirt, but there may be times wherein you overlook your elbows and knees and fail to thoroughly clean them. If you have dark knees and elbows, it could mean that dirt has penetrated the layers of dead skin cells. Friction: Constant friction due to stretching or rubbing will inflame the skin, but it will grow thicker outer layers to protect itself. This thick layer will look darker than the healthy skin around it. Sunlight: Much like the rest of the skin, sunlight can darken your knees and elbows, especially since there are dead skin cells here, which get darker when exposed to the sun. Dryness: There’s little moisture on these parts, to begin with, and it can get even drier when neglected, causing inflammation and peeling. If you want to bring back the natural color of your knees and elbows, here are a few, readily available items that you can reach for. This citrus fruit has natural bleaching properties to bring back your skin tone, and vitamin C that can help remove dead cells and promote skin cell regeneration. 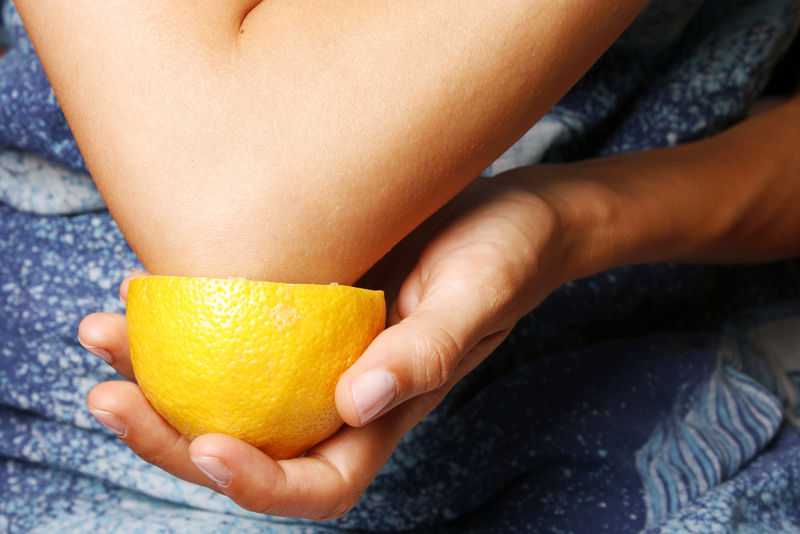 Apply and massage lemon juice on your problem areas (make sure you don’t have an open wound), leave it for 10 minutes, and rinse with warm water. Repeat these steps for at least two weeks to get the desired results. More than just helping you create baked goods, baking soda is another effective skin-lightening agent. Do this by creating a thick paste with baking soda and milk and applying this to your elbows and knees. Wait 5 minutes before rinsing it off. Do these once a week for two months and watch your problem areas lighten again. When it comes to skin hydration and moisturization, aloe vera is the go-to plant. However, it’s also believed to be a natural skin lightener that promotes the repair of sun-damaged skin cells. 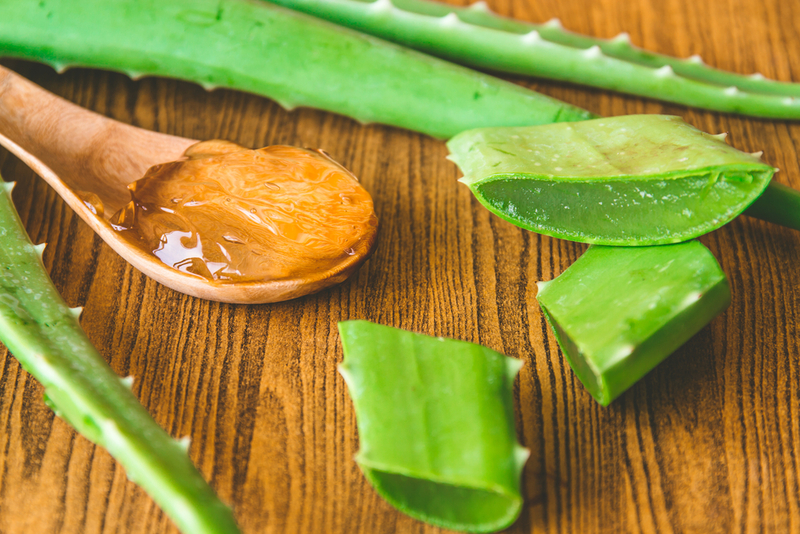 Bring back the suppleness on your knees and elbows by first opening a fleshy aloe vera leaf to get the pulp.Apply on the rough skin and leave on for 20 minutes. After which, rinse with cold water, and as an option, put on moisturizer. Do this twice a day for two weeks. The vitamin E in coconut oil makes it a great moisturizer, but it also helps in lightening the skin tone. Massage your problem areas with coconut oil, and then shower with warm water only. DO NOT soap. Pat your skin dry. You can also mix 1 tsp. of coconut oil and 1/2 tsp. of lemon juice. Rub the mixture on the knees and elbows, and then wipe off after around 20 minutes with paper towels. Do this daily. Another gift from nature to help you moisturize and lighten your skin is olive oil. Start by making a scrub of 1 tbsp. each of olive oil and sugar. Sugar is another natural exfoliant that helps remove dead skin cells, so this can help lighten your problem areas. Prevention is better than cure, so if you want to maintain supple skin on your knees and elbows, always be vigilant when showering and thoroughly scrub off the dirt. After which, use a lotion or moisturizer to keep it from drying out. Lastly, you can also slather some sunscreen on these parts, especially if your clothes don’t cover your knees and elbows. Julia is a beauty and lifestyle writer. She’s a contributor for VMV Hypoallergenics blog. She likes reading skin care tips, travelling with her friends and exploring new places.